Here is a conference that my sister has shared with me. I am forwarding it on to all of you, not as an endorsement but simply sharing the information. I am in California so if anyone is interested let me know if you are attending. 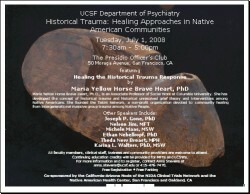 Maria Yellow Horse Brave Heart, Ph.D., is an Associate Professor of Social Work at Columbia University. She has developed the concept of historical trauma and historical unresolved grief theory and interventions among Native Americans. She founded the Takini Network, a non-profit organization devoted to community healing from intergenerational massive group trauma among Native People. All faculty members, clinical staff, trainees and community providers are welcome to attend. Continuing education credits will be provided for MFTs and LCSWs.